I've mentioned before that there were some shortcuts taken when our house was last renovated. One of them was in the bathroom on the first floor. While they did an excellent job with the remodeling in general, there were some things that just weren't done right. One of those things was the installation of the towel bar. For one, they originally installed the towel bar so far behind the bathroom door that there is actually a dent in the back of the door where it has been swung open with such force that the towel bar has left an imprint in the wood. Also, they didn't install the towel bar into the studs behind the wall. Now, I know this isn't an absolutely necessary thing, but drywall was not meant to hold extremely heavy things, like wet bath towels, even if you use anchors with the hardware. It doesn't seem like the bathroom was used much by the last homeowner, as it was just one person living in the house, but for the time that my family was living with us, they used the bathroom on a daily basis. And the towel bar didn't really last that long. By the time they were ready to move out, the bar was just barely hanging on, and the drywall that was holding it up was cracking and breaking apart. I removed the towel bar to find multiple holes on each side, where it looks as though this problem has existed before and the bar was simply moved up an inch each time. Considering that the rest of the drywall was starting to break and it's strength was essentially non-existent, I moved it to the right a few inches to a part of the drywall that was in good shape. The next step, however, was to patch those two spots, and I had just the thing to do it with. One of the last times I was at Lowe's getting paint for the trim in the house, I was waiting by the paint counter for the gallon to be mixed and happened to look down at all of the painting supplies they had right there and saw the coolest little thing. 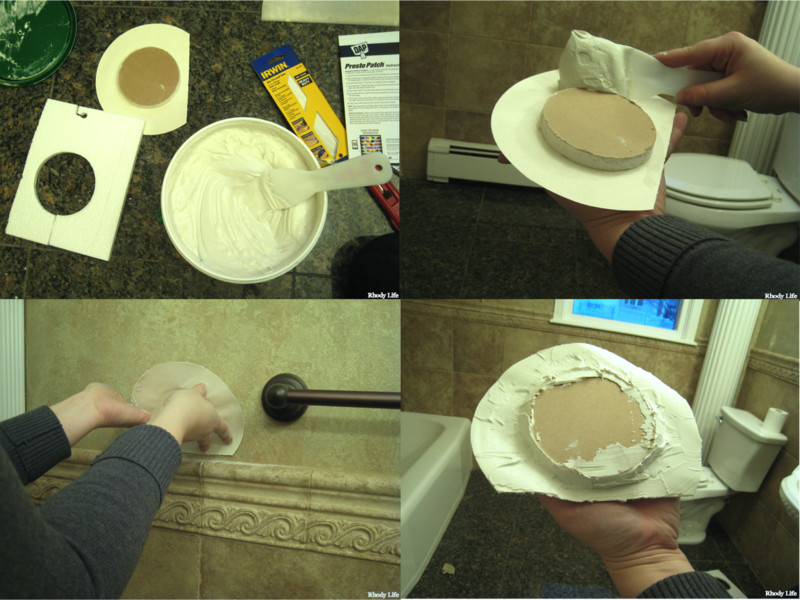 It was called the Presto Patch by DAP, and it's a 3" drywall circle that is made for small repairs in walls, just like the ones that I had. I picked two of them up, knowing that I had this project to complete and brought them home, excited to try them out in the bathroom. In addition to the Presto Patch, I used a few other tools and supplies for this project: Box Cutter, Drywall Saw, Putty Knife, Drywall Knife, and Joint Compound. All of these supplies can also be found at your hardware store, although some of you may already have them on hand. To patch the wall, I first opened the Presto Patch package and removed the styrofoam protector they put around the drywall circle. Using the styrofoam circle as a template, I placed it up against the wall , making sure I had the spot centered in the middle, and then traced around the inside of the cutout with a pencil. 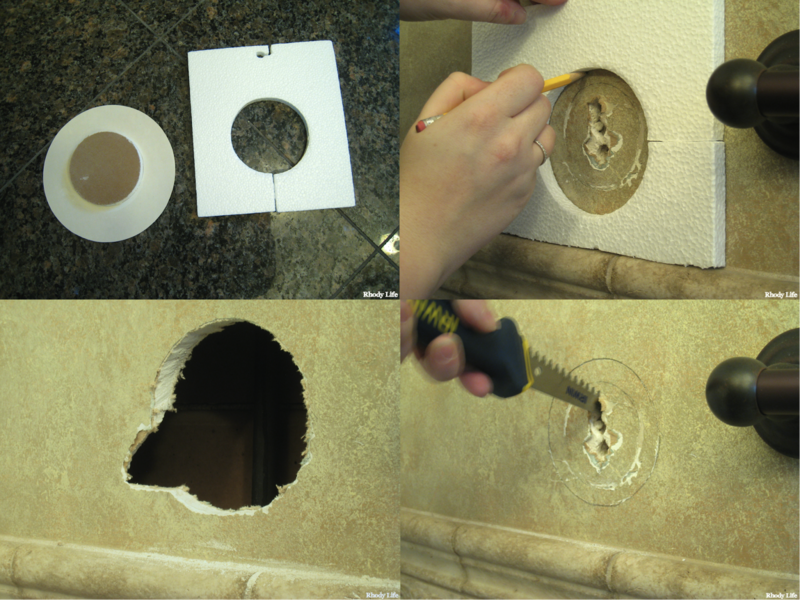 Then, using my drywall saw, I started cutting out the broken drywall, inserting it into one of the holes that was made by the towel bar. You'll notice in the picture below that my drywall was so damaged that a larger piece chipped off on the left. Don't worry if this ends up happening to you, because the paper that is attached to the Presto Patch will likely cover it. Once you have your hole cut, dry-fit the patch into the hole that you have just cut out. If it fits perfectly, you're ready for the next part, but if you can't fit it without forcing it, round out the hole just a little bit more with your drywall saw. You'll want a tight but not-too-tight fit for this hole, that way the joint compound can expand into the space and secure the patch in place. Depending on the location of your hole, you may also need to trim some of the paper that is attached to the Presto Patch. In my case, I had some tile that started just below the patch, so I cut the bottom part of the paper off the patch, and left enough room that my joint compound layer wouldn't hit the line of grout attaching the tile to the wall. Next, it's time for the joint compound. Using your small putty knife, mix up the joint compound to make sure it has a smooth and wet consistency, not a dryish crumbly one. Apply some joint compound to the putty knife and spread it around the outside of the drywall circle. Once you have the outside of the circle covered, spread more onto the paper, making sure you get it completely covered with the compound. When the paper backing begins getting floppy and damp from the joint compound, you are ready to put the patch in the wall. I found it easiest to insert the patch from the bottom up, rolling it slightly to get it to fit. Once you have your patch in the wall, press lightly to make sure that it has gone into the hole enough. Using your small putty knife again, start from the center of the patch and work your way out towards the edges of the paper, gently squeezing the excess joint compound out from between the paper and the wall. When the excess compound is removed, switch to your larger putty knife, and begin applying a layer of joint compound to the outside of the paper. Continue to spread the compound until you have the paper backing completely covered and you have a level and smooth coating on your wall. Once this layer dries, you can feel free to sand down the joint compound and add any additional layers if you feel you need more coverage. And with that, my wall was Presto Patch[ed]! If you are looking for more information on how to get your joint compound layers to be level and even, check out this week's earlier post about patching a large part of a wall. Oh, and don't forget to prime these patch spots before painting over them. Joint compound if very absorbent, and will eat up your good paint, so treat it with primer first to help the color be even on your entire wall. I have to say that after having replaced a large portion and a small portion of drywall in the last few weeks, I am glad that DAP came up with this easy to use Presto Patch. The paper backing that they use means you don't need to attach the drywall to a stud, like you do when you replace a larger portion or an entire wall. It was quick and very easy to understand, and I believe that even if you had no experience with this before that you could easily accomplish this project. Have you ever used the DAP Presto Patch? What was your experience with this product? What else have you used to patch a hole in your drywall? PS - Sorry for all the wonky colors in these pictures. The lighting in this room is awful and I did this at sunset one night so the natural light coming from outside was literally changing every minute, and my camera did not like it. I tried to edit them as much as possible, but there's only so much color changing you can do before things start looking either neon or black and white. Please Note: I was not compensated for writing this post. I was not contacted by DAP or Lowe's to provide this review. All opinions are my own.